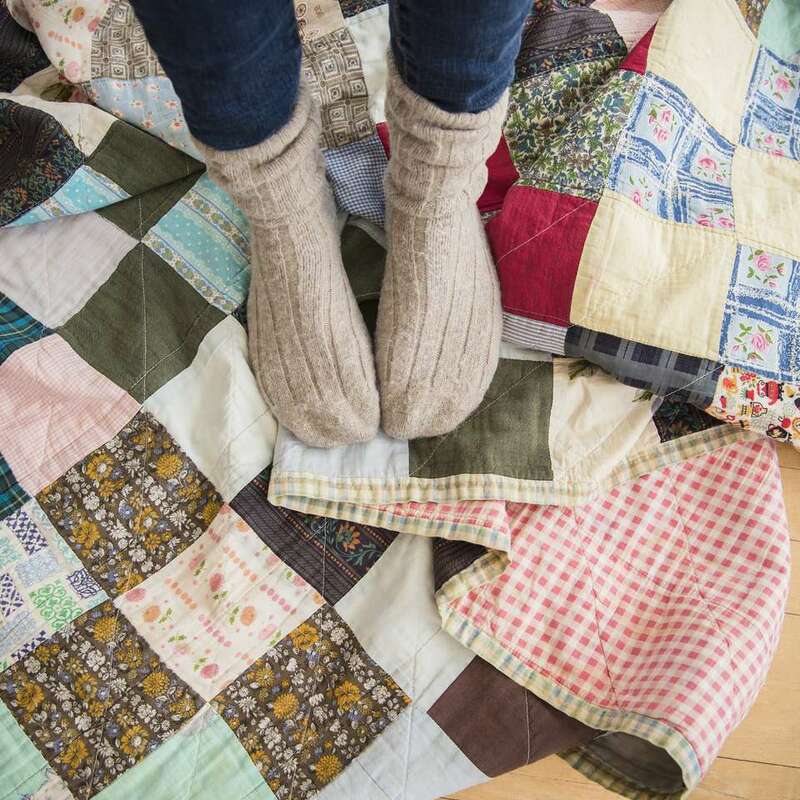 Charm quilts are a type of scrap quilt—quilts made with lots of different fabrics, although some fabrics are usually repeated in a scrap quilt's layout. But when quilters make a charm quilt, no fabric is used more than one time in the quilt. Sometimes quilters use a fabric twice by flipping one of the patches over to make its reverse side the front. That's a perfectly acceptable charm quilt technique. Charm quilts have been popular since at least the 1800s, so you'll find many examples when you view displays of vintage quilts. Try these techniques to put your leftover scraps of fabric to good use by making a gorgeous charm quilt. Charm quilts are usually one patch quilts, designs that repeat a single shape over and over. One patch designs often used for charm quilts are Thousand Pyramids made with equilateral triangles, Tumbling Blocks made with diamonds, and Grandmother's Flower Garden made with hexagons. Hexagon charm quilts are typically sewn together using English paper piecing. Quilts sewn from small squares of fabric are often called postage stamp quilts. Some are charm quilts made with thousands of squares that typically measure 1.5-inches-by-1.5-inches (each finishes at 1-inch square). Squares can be as small or large as you wish—choose a size that's comfortable to work with and suits your leftover scraps of fabric. Charm quilts made from squares are a good choice for beginning quilters and are easy to sew by machine. Other shapes can be machine sewn, too, but often require set-in seams or offset angled edges when sewing. The Sixteen Patch quilt block pattern could be used to assemble individual blocks with 16 different 2-inch-by-2-inch squares. Keep track of the fabrics used and do not repeat a fabric. Ignore the color guidelines in the pattern—just follow the sewing instructions. When you have enough blocks for a quilt, sew them into rows and then join the rows. Row one could be sewn from 20 2.5-inch-by-4.5-inch rectangles. To offset the seams, use 18 of the rectangles but begin and end row two with a 2.5-inch-by-2.5-inch square. Repeat the row arrangement as you assemble the quilt. Other sizes work just as well, and rows can be even more staggered. Use your imagination to create a unique layout. It can take a while to accumulate enough scraps of fabric to make a charm quilt. Many quilters swap fabrics to help speed up the process. Five-inch-by-5-inch squares are a nice size, and a good size to swap with other quilters. You might prefer to select a specific shape and start a scrap bin, especially for a charm quilt. Each time you have leftover fabrics, cut one piece from each and place it in the bin. When you've accumulated enough for a quilt, arrange the patches on a design wall to establish a layout. Sort your fabric scraps by size. When you find a charm quilt pattern you'll know exactly which bin to grab. Maybe you aren't sure which shape you intend to use for the quilt. Just cut a piece of fabric and place it into the collection bin. Be sure to accumulate contrasting fabrics, from light to dark. Contrast among patches allows a design to emerge when patches are joined. Packets of fabric are often sold in bundles that are labeled charm squares. Don't confuse the name of a product with an actual charm quilt.